Our friend Ben has been hard at it clearing the corridor for our new orange trail! We need your help cleaning up the 10 mile trail corridor and finishing the project strong! We are aiming our focus on sustainability. By preserving & enhancing the trails, park users can enjoy them for generations to come! Lake McMurtry boasts over 30 miles of multi-use trails and is home to one of the best trail systems in Oklahoma. Each trail offers a unique set of experiences which makes it worth your while to try them all! There are 2 trails located on each side of the lake and are connected via the Green Trail. 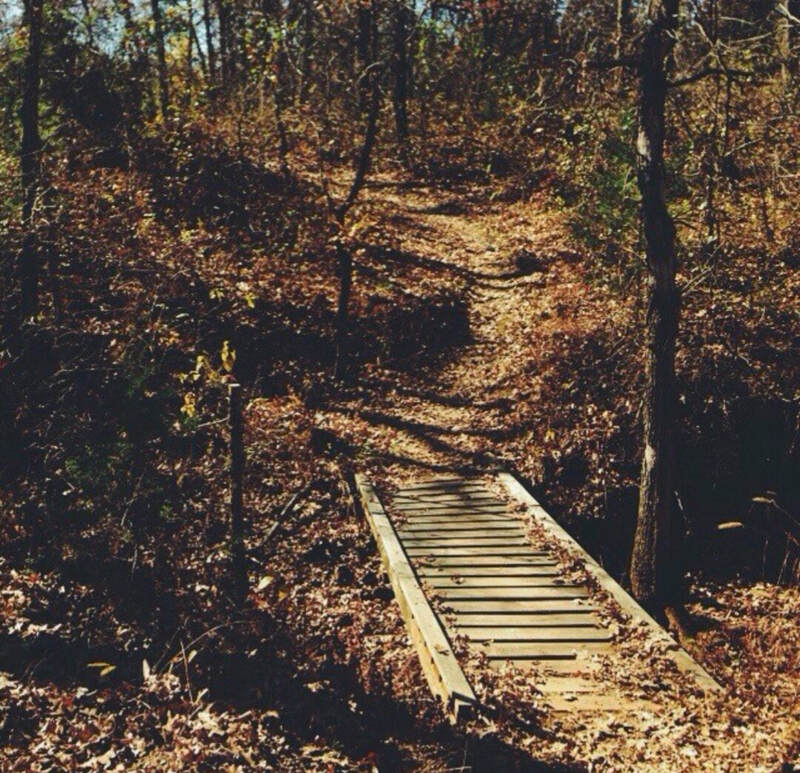 Lake McMurtry's trail system provides exceptional trails for hiking, trail running, and mountain biking. Some of the trails even have designated campsites along them. Check out the descriptions below to learn more! Stay off the trails after a hard rain or when they are muddy. Plan ahead: Get familiar with the area, know the park rules, check the weather. Less is more. If you are trying out a new activity or a new trail system take it slow and don't over do it. Take a look at the trail maps to understand how the trails are laid out. Always let someone know when you plan to hike or bike the trails. Wear appropriate gear and clothing and adjust your gear according to the season. One of the most used trails at Lake McMurtry the (SE) Red Trail is a favorite among mountain bikers and trail runners. The Trail is a multiple loop arrangement, allowing users to loop back to the traihead without backtracking. The Southeast Trail is connected to the West Side Blue Trail via the Green Trail. The Red Trail has three distinct sections. The first section includes a number of short climbs and gully crossings providing fun and interesting terrain on foot and bike at any speed. It can be technically demanding at bike racing effort. The second section runs along and across dry creeks and gullies, typically just out of sight of the edge of the lake. The trail then opens up with long straights, sweeping turns, and small bumps across open fields. It winds under oak canopies and traverses the occasional series of gully crossings.The third section is a series of steep gully crossings, switchback ascents, interrupted by short straight transition sections. The final mile is a roller coaster of short climbs and descents, dramatically opening into a straight section across an open field and back to the trail head. Much of the trail is far from roads, the water’s edge, and other heavily used parts of the lake property. The result is quick and easy access to peace and quiet and a feeling of isolation. Visitors enjoy constant interest with changes of scenery and fun trail features. The trail path itself provides cyclists with the opportunity to improve both high and low speed bike handling. Most challenges are easily navigated by novice level riders by simply reducing speed. Runners and cyclists enjoy wide, sweeping curves and transitions with few technical challenges to interrupt flow or momentum. Runners find themselves challenged in the beginning and end sections to smoothly transition through the quick successions of short ascents and descents. 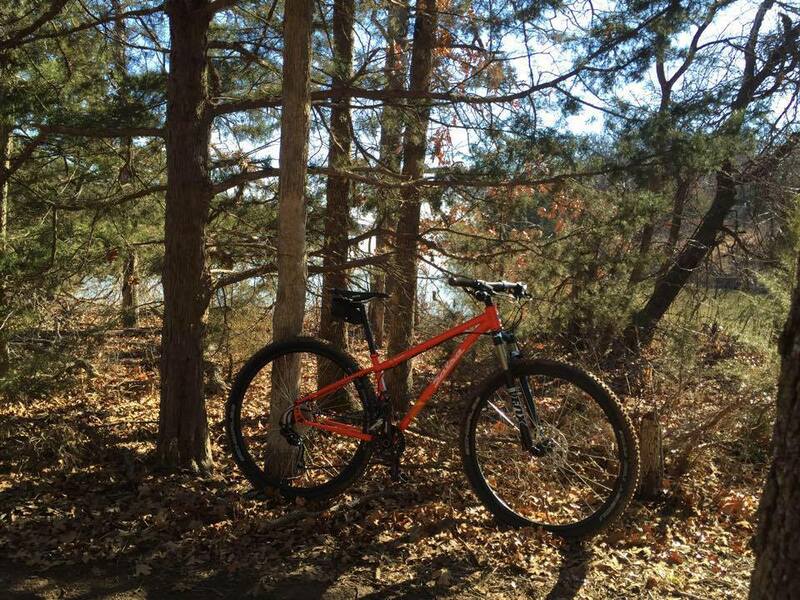 ​Often considered the most challenging of the four trails at McMurtry, the (NE) Yellow trail can be a bit frustrating at times for the casual rider. Roughly half the trail is 2-way so you'll need to be aware of oncoming traffic. The first mile is often frequented by hikers, fishermen, disc golfers, etc., so please be mindful and use trail etiquette in giving them the right of way. Once you make it roughly a mile in you'll turn back west and hit a long dry creek bed with rocks to test your basic skills. When you hit the northern straightaway with the barbed wire fence to your right, be mindful of a large, steep rock drop.There is a easy route running to the left that will get you down safely. At approximately 3 miles, you'll pop out at the northernmost point and the trail makes a hard left. At 3.5 miles, you'll hit another steep, rock drop followed by a tough climb where you may have to hike-a-bike for a short bit. This northern end of the trail after the U-turn is the toughest section for mountain bikers. Not to worry, it doesn't stay tough for long and still provides a fun and scenic challenge. On the return trip, pay attention to the directional signs as there are sections that are not 2-way traffic. Roughly 5.75 miles in you'll enter an unusual section of cane/grass. It's neat to note, as this stuff was around when dinosaurs roamed. The ( NW ) Orange trail has some of the best views of the lake. Take a right at the fork right at the start, this will wind you out to the gravel road around .7 miles. As you head north on the gravel section, you'll happen upon a yellow gate. This is to prevent unauthorized vehicles from accessing the police gun range. Trail users have full permission to pass, there is a small opening just for us on the side. Do not feel anxious, zip on through and continue up the gravel road. Continuing on you'll make it to one of the toughest, short climbs of the trail. Soon you'll see that same intersection you passed by earlier. When you do, take the service road to the right about 100 yards and you'll see the sign directing you to the right which leads into Sleepy Hollow, a favorite section. In this area you'll find twisty track, open views, technical climbs, a hairy descent or two, and more wildlife than expected. The (SW) Blue Trail is just over 7 miles in length, out and back. The trail is a meandering single-track that flows through heavily wooded areas as it follows the shoreline of Lake McMurtry. The southwest trail is considered fast and flowy, or easy, as compared to the northern trails at Lake McMurtry. The first half mile consists of level terrain that twists and turns as it approaches the lake entrance road, and then gently descends and hops out on the windy road for a short way before climbing out to continue winding its way south. 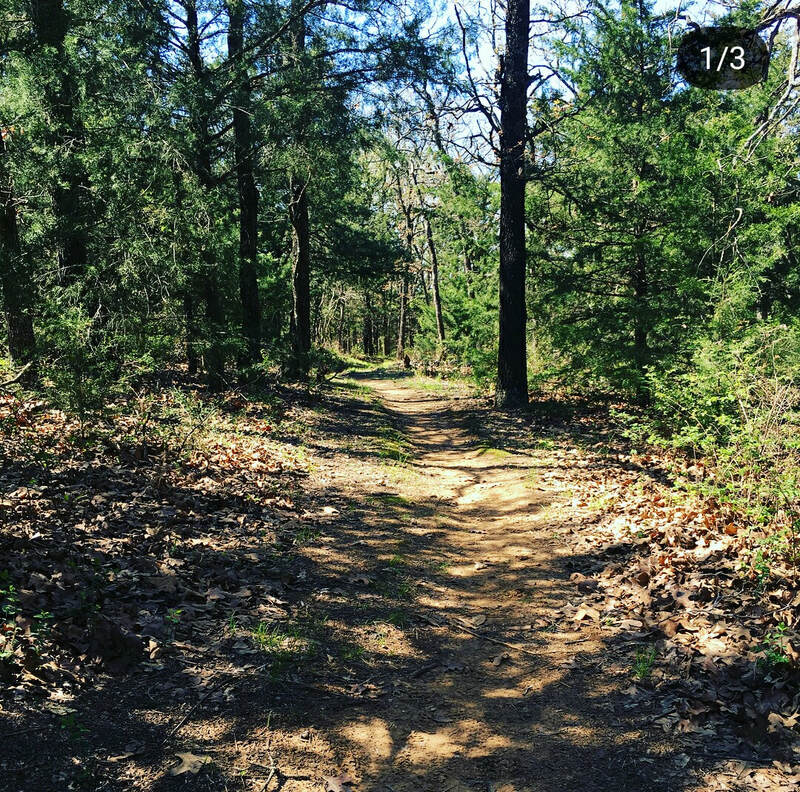 The trail continues to climb up over rugged terrain before leveling off to a stable and solid path.The trail continues along the shoreline following its contours in long sweeping turns through native Oklahoma woodlands. Occasionally the trail will take a tight turn between or around an oak tree, or cross solid rock in a low water crossing. The trail also passes primitive camping areas. There are 3 bridges on the trail that traverse otherwise steep, rocky, and typically wet channels. There is a short loop at the southernmost extent of the trail. At this point the trail meets up with the Green Trail and if you're feeling ambitious you can take the Green all the way to the east side of the lake. After that the trail forks where the natural flow continues to follow the shoreline, dipping and diving along the way, until it turns back into the woodland to loop back around to the fork where it reverses course to return the trail user along the path to the trail head. ​This fantastic addition to the Lake McMurtry trails connects the end of the Blue Trail to the Red Trail so you can ride all the trails without going to the surrounding dirt roads. It's a short winding course as it leaves the Blue Trail. It catches some service roads to the lake damn, and then follows a mowed trail over the dam to the Red Trail. There's a pretty good climb if you're riding from east side to the west side. This trail does cross the damn at the south end of the lake which makes for excellent photo opportunities, but be advised that you must stay on the trail and not veer off onto the damn. If trail users were to start making new lanes along the damn it would potentially be harmful to the watershed structure.